Pan y circo (bread and circuses) was a sentence coined by the Roman poet Juvenal to criticize the populist policies adopted by the politicians at that moment. If the economy is decreasing, don’t worry, let’s host gladiator combats, a quadriga race or a massacre starred by hungry lions eating up some scared Christians. Of course, some of these shows are gone now, but not the spirit of Juvenal’s sentence. This month will go down in history of Spain because of the goverment’s shortest term in office. Finally, we’ll have new elections in our country. However, is that the citizens’ main concern? No, it’s not. May is the month of our particular circus: el fútbol (football or soccer). Competitions are coming to an end and we’ll see exciting final matches in La Liga, the Champions league, the Premier league… Today, we’ll talk about games, but not so important as football. Definitely, human beings like playing, even a solo card game is enough to waste time. Card games have been a source for colloquial expressions which had their origin in the rules or actions during those games. Let’s see some of them. Ir de farol: used in betting card games to express how a player pretends to have better cards than he actually has (bluffing), nowadays it’s used to express when a person says he’s going to do something but at the end he’s not. Un farol (a lamp) can blind us if we look at it intendly in the same way a big bet can blind us at first. For example: no te creo, vas de farol. Cantar las cuarenta (literally, to sing the forty): this action is played in some games such as tute o cuatrola. It happens when a player has a horse and a king suited (in a Spanish deck). At that moment that player wins forty points which means he’ll probably win that hand. Currently it’s also used with the meaning of telling somebody off. For example: cuando llegue a casa mi hijo, voy a cantarle las cuarenta. De órdago: one of the most authentic Spanish games is mus. In this game we have to bet points. If a player says “¡órdago!” means he is all in. In a general use, it means something is amazing or huge. For example: tengo un problema de órdago. Ser un as en algo (to be an ace in something). El as is the most important card in most of games, so, logically we call as to somebody who is a genius doing something. For example: soy un as jugando al fútbol. Poner las cartas sobre la mesa (literally, to put the cards on the table). 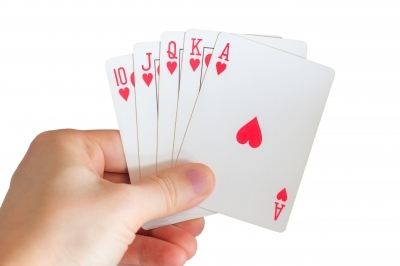 This is usually the final action in a hand. When you show your cards, you also show all your weapons. That’s what we do in real life if we ponermos las cartas sobre la mesa: we really show what we can do without any subterfuge. For example: necesitamos completar este negocio, vamos a poner todas las cartas sobre la mesa. Pintan bastos: the Spanish cards have four different palos (suits): copas (cups), oros (gold), espadas (swords) and bastos (cane). Each one refers to the different powers: ecclesiastic (copas), economical (oros), military (espadas) and popular (bastos). Of course, it’s difficult to imagine the peasants’ victory against the rest; it’s unlikely to happen. In other words, if pintan bastos in a situation, it’s not a good sign. For example: íbamos a salir esta noche pero pintan bastos: está lloviendo. Tomar cartas en el asunto (to take matters in your own hands): if you decide to play a hand it’s because you think you can win. Because of that, if tomas cartas en el asunto, you are taking part on it. For example: este problema ha durado mucho tiempo, debemos tomar cartas en el asunto ahora mismo. In conclusion, colloquial expressions have come to our time because they’ve been used for centuries. Slangs that you use in your videogames, role-playing games or boardgames currently, they might be used in daily situations in a few decades. On www.spanishviaskype.com we think that learning Spanish via Skype shouldn’t be a tedious task but a funny experience. So, do you want to play a game with us? Start reserving a free trial lesson here: serás un as hablando español.